Daredevil has become an in-demand guest star lately. Not only is he a regular in New Avengers (at least for the time being, the series ends in two issues), he also appeared in Winter Soldier #12 last week and in this week’s X-Men #38. Daredevil: End of Days #2 also came out this week, but I’ll have to get back to that in a separate post. For now, let’s take a brief look at these other issues. 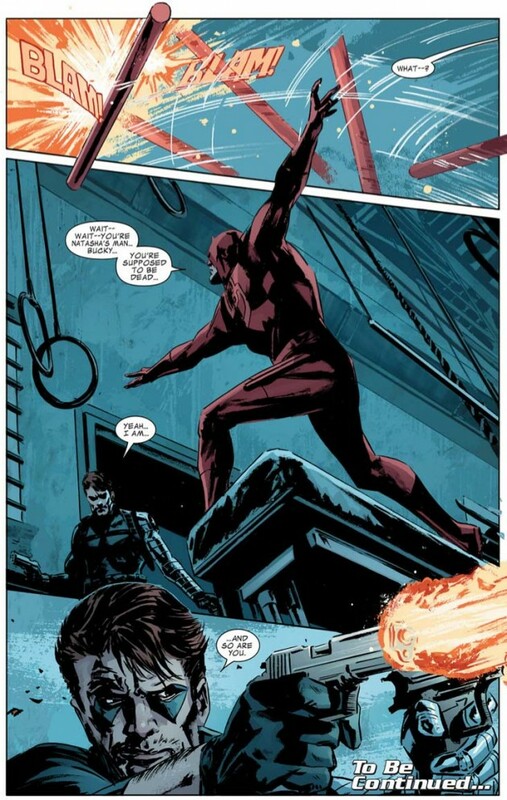 Daredevil, now a target of the brain-washed Bucky, appears in the final few pages doing some pretty classic Daredevil stuff, that is working out in his basement. As one would expect, his senses cue him into his intruder’s presences before he barges in, but we’ll have to wait until next issue for the real show-down. About a week ago, I complained on Twitter that the English language lacks a proper translation for the Swedish term “buksvåger” (= abdomen + brother-in-law), or “bukis” for short. It jokingly describes the relationship (whether they’re aware of it or not) between two men who share a past or current lover. The Marvel universe is full of “buksvågrar” (plural). Let’s face it, the heroes of the Marvel U hump each other more than the cast of Grey’s Anatomy, and situations like this one reminds us of that fact in a way that is quite funny, albeit not deliberately so. 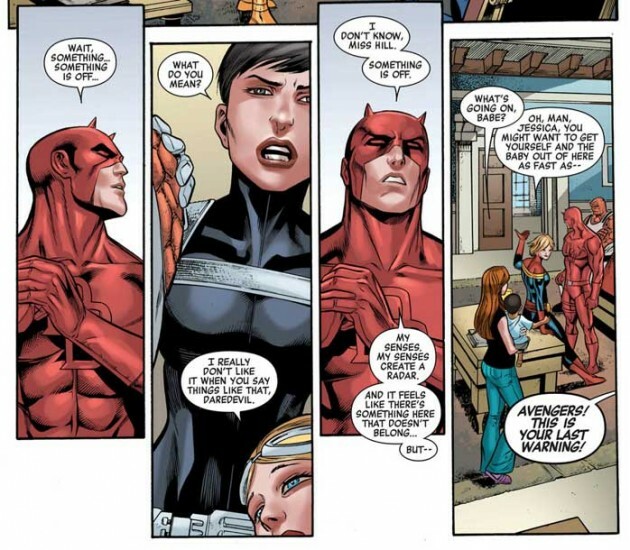 While Daredevil will likely survive his current predicament, it’s an interesting twist seeing the characters’ past relationships become quite so central to the story. X-Men #38, the first issue of a two-part story, is a fun little team-up between Daredevil and the mutant Domino. 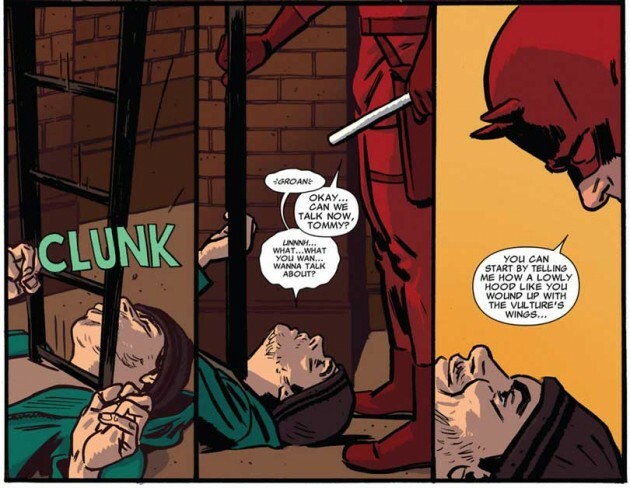 The tone is well in line with the lighter take on Daredevil we’ve seen in Mark Waid’s handling of Matt Murdock. In fact, it may even be one shade lighter. Nothing really substantial happens in this issue, it’s more like the answer to “what else did Daredevil do this week?” (though it’s clearly set before the events of Daredevil #18 and #19), but it’s an enjoyable issue that doesn’t take itself too seriously. I wasn’t a big fan of Paul Azaceta’s previous solo artwork on Daredevil (i.e. Daredevil #106, vol 2), but it’s much better here and a good fit for the story. I really like the concept underlying Bendis’s take on Daredevil’s senses, but I have always been critical of the actual execution. What does “something that doesn’t belong” feel like? Don’t get me wrong, we all have experiences that stand out for reasons we can’t pin-point, but suffice it to say that I’m once again reminded of that South Park scene with the underwear gnomes and their flawed business model. Step one, Daredevil has hyper-senses; step three, he magically knows stuff. Oh well, I’ll try to go a little easier on Bendis & Co. for my upcoming review of Daredevil: End of Days #2 (despite one scene that almost took me out of the book!). 😉 I will see you again shortly! Yayyyyy! Bucky + Daredevil + getting name-dropped in TOMP = head exploding from awesomeness!